The foodism 100 initiative sought to shine a light on the venues and businesses effecting positive change in the London food and drink industry. First up on our list of winners is Gourmet Goat, who took home the Best Street-Food Trader award, sponsored by the Soil Association, on the night. They fended off competition from the likes of MYPIE, Club Mexicana, and The Roadery to win their award. Nadia and Nick Stokes. 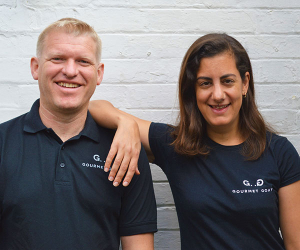 The couple combine an enthusiasm for righting the wrongs of the goat dairy industry – where billy goats are often killed at birth – by buying ethically reared billy goat meat and turning it into some of the most delicious Eastern Mediterranean-inspired cooking you'll find in London. Nadia's background, coming from rural Cyprus, is an inspiration for the flavours to be found on their Borough Market stall's menu. They're regular winners of SRA Awards, are Slow Food-approved, and have also taken home a BBC Food & Farming Award, too. The stall serves self-described “East Med Village Food”. This means plenty of flavours and dishes you'll recognise from Mediterranean and Levantine food – think kofte, pita wraps, pilaf and tzatziki – made with slow-cooked kid goat where you might ordinarily see lamb. There's also rose veal and mutton, two other often-overlooked meats undergoing similar ethical renaissances in the food industry, all sourced from high-welfare British farms. They trade Monday to Saturday in the heart of the historic Borough Market.